Hi all, how’s your fall? Are you enjoying the cooler weather, the falling leaves, and the colors of the season? How gorgeous is this display at my local grocer around the corner? A perfect harvest scene! It just doesn’t get much better than this . . . Except when you arrive home to find a little treat bag on your door, and you have no idea who left it there. This is the second time this week a treat bag has arrived anonymously on our front porch. I had never heard of this Boo Game until this year, my family and I are smitten with it! These anonymous ‘Boo’ treat bags are akin to the ‘Secret Santa’ and they are a fun way to spoil your friends and good neighbors. Perhaps you’ve been BOOed too? This is especially fun with small children, and ours all happen to live in same neighborhood and attend the same local public school so they are all giddy with excitement at school trying to find out who BOOed who. We’ve been BOOed twice, so we decided it was our turn to spread the BOO around yesterday. The game is simple. You fill the treat bags with inexpensive Halloween delights, then include the Boo Poem, like this one I recreated (below), and you secretly leave it on your neighbor’s doorstep. Then you send out your fellow conspirators to do the deed. BOOing someone else is always kept a secret. We hope you’re having just as much fun as we are in the lead up to Halloween. Have you ever been BOOed? I’ve never been boo’ed but I know plenty who have! Such a cute tradition. Perhaps I need to start it this year in our neighborhood! I love this idea!! Sadly, I don’t live in neighborhood to do this! 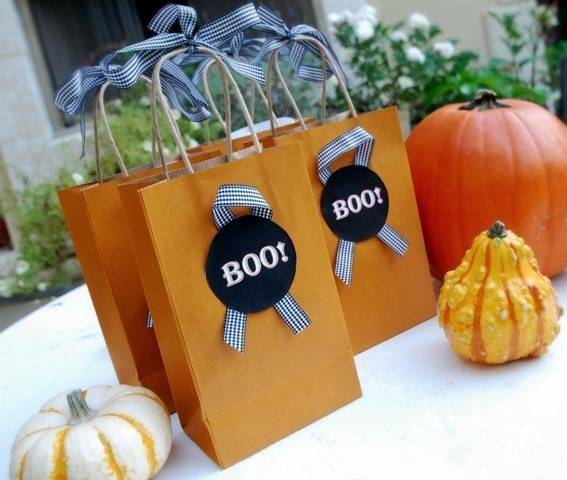 Your trick or treat bags are cute, as is all of your other crafts!! I’m a new follower and I love your blog and all of your wonderful ideas! Our neighborhood has done this ever since we moved here 8 years ago. It’s fun and you’re right – the kids especially love it! We include a cute picture of a ghost that is to be hung in the front window so that you’re not booed more than once. It’s fun to watch it spread throughout the neighborhood and see who’s been booed so far. By Halloween, everyone has a ghost in their window! Also, Hallmark has really cute Boo kits. I’ve never heard of this before either. And I LOVE it! Here in DC the leaves hit their peak yesterday, and the air smells like crunchy leaves. It really feels like fall now. That’s really a fun idea that I hadn’t heard of until this year. I have not been BOOed, and have not done it to anyone. . . I’m overwhelmed this year because I’m trying to open my Etsy shop by Thanksgiving, but next year this would be something fun to do!! How cute! I’ve never been Boo’d either. No young children here and my neighbors are older. Still who doesn’t like a cute treat! My kids love this. It is so much fun. They love the excitement of sneaking up to someone else’s house and then running away. We live in North Texas, and we have been boo’d this year! It is a fun idea, and we had fun putting together treats for our neighbors. The only difference for us is that in our neighborhood, we were asked to tape the note that came with our treats to our front door, so that everyone would know we had already been boo’d. I love the spider on top of the pumpkin, by the way. He’s a kinda creepy, without being too scary for little ones. What a cute idea! They definitely don’t do that here in NYC. I think people would be frightened someone left a bomb on their porch. Kate, Oh how I love these goodie bags…I’ve never been boo’ed…sounds like a fun game! Im new to my neighborhood (4 months) and dont quite know my neighbors yet, but im thinking of preparing some similar bags or perhaps goodie baskets to introduce myself and finally meet them. Is that your daughter in the pic? She’s so cute!!!! We have been doing this for years in the different military communities that I have lived in. I always include some cute homemade decoration in the bag for the moms. We have done this for family with smaller kids and even for couples that have no children. It is always a nice surprise. We include a Ghost of some sorts for the person who has been booed to display on their front door so more families can enjoy being booed! I’ve never been BOOed and this is actually the very first time I’ve heard of something like this. I think it’s just Grand! Although it kinda reminds me of ‘chain letters’ (that I don’t like at all) I think it is a great idea to spread the Halloween cheer. We’re moving into a new housing development in a few months. I’m thinking of making this BOOing game a start of something fun for our new neighborhood. Can’t wait for next year! Yes! We booed our neighbors last year. So much fun seeing the signs pop up in people’s windows. I need to get moving and get my treats done today.. kinda late this year Last year we did fancy cut out cookies. I think this year we will do peanut butter ghost poop. Neat idea. Not everyone thinks Halloween is something that should be celebrated (kind of very bible-belty here). Since, we just moved to a new neighborhood we’ll probably try this next year once we have felt out the neighbors. How fun! 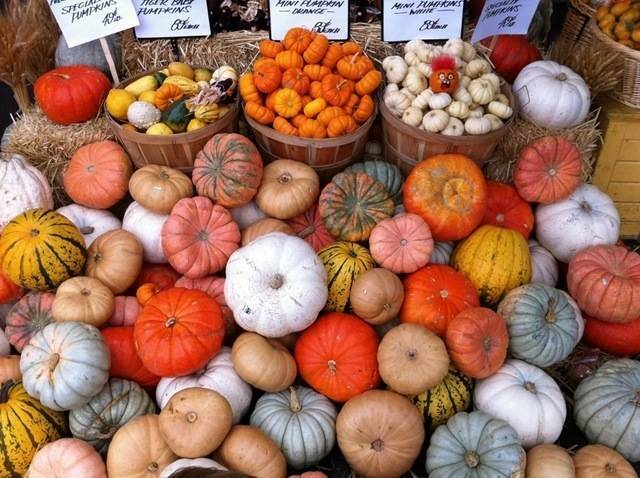 You are so lucky to have all those gorgeous pumpkins right around the corner from you! Here in NY they look at you crazy if you ask them for a white pumpkin! Also, forgot to mention LOVE the first picture. I wish I could afford to stack them like that at my house. Of course if I did then everyone would think I had them for sale. Lovely post! I did not boo or get booed this year. :( We are in a new neighborhood (to us), and don’t have any immediate neighbors with kids. Total bummer. We should have new neighbors for next year…I will save your post for then! Happy Halloween! That does sound fun! What a nice little surprise, too. Our neighborhood does this too, so fun! In our neighborhood they call it ghosting. With each goodie bag you get a ghost to put on your door to show you’ve been ghosted. The kids run around after dark and make the deliveries. what a darling idea! i live in an apartment building, so i’m not sure that my fellow neighbors would participate, but i’m going to pass this along to my neighborhood dwelling friends! so sweet and fun! We have been boo’d before, but never with such a cute poem. Thanks for sharing this! When we lived in Michigan, we were delighted to be the recipients of May baskets on May Day. Children in the neighborhood would bring treat-filled baskets or bags to the door, ring the doorbell, and then run away. Finding those little baskets of goodies was such fun! This is so fun! I wish (most of) my neighbors weren’t anti-Halloween/Holly Rollers. Maybe I can just anonymously mail a BOO to a friend. I like the part about having something to post to show you’ve been booed. Could even make a nice fundraiser out of it for a charitable cause. Over here in New England, we call it getting GHOSTed! We have a similar little sign/story that we put up when we get ghosted….our whole neighborhood would participate when we were growing up. We loved it! We’ve been BOOed last night! The difference is that we put a ghost cartoon sign at our door to let other neighbors know that we’ve been booed already. On Halloween, we’ll see how many houses got booed by seeing the ghostly signs on their doors. When my boys were little and we had just moved to a new neighborhood, my nextdoor neighbor “Boo’d” us and that was a start to a tradition. We loved it!It was so fun seeing all the “Boo’s” in our neighborhood. My boys boo’d their teachers every year and got so excited seeing the surprise on their teacher’s faces. And last year I had a “Boo” party in blogland. We’ve been Boo’d but in another neighborhood someone started a pass the pumpkin *filled with candy* so everyone could be included not just houses with children : ) It brings out the kid in everyone!! I love this idea! I have never heard of it before, but I think it sounds fantastic! I’m a new reader to your blog, and I am absolutely loving it! What a cute idea!!! I know just the neighbors to Boo! Also want to do a painting of your 1st image, amazing! What a fun idea! I’d never heard of this and think it is so great. Thanks! 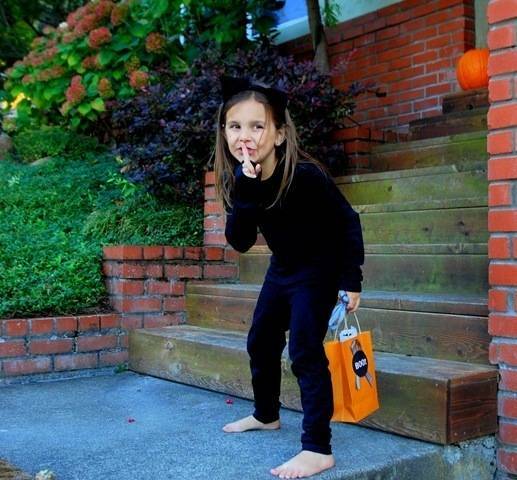 We “boo” in our neighborhood too… love your printable. Going to use it!!! Merci! We were booed last year – it was a lot of fun! And ours came with a “boo” sign that you put in the window, which was fun to see how far it spread throughout the neighborhood! My daughter who is 10 has been booing her friends for a few years now. We’ll have to copy your “poem” this year. Thanks! We get “Ghosted” in our town. We wait until dark, park down the street from our target house. It’s exciting for the kids to be so “stealthy” and dodge from tree to tree. Very funny. We are laughing so hard that I’m sure they hear us coming. The whole town is in on the tradition so we don’t have to worry about disturbing anyone. Fun family memories and teaches the little ones how good it feels to do something nice for others. We “BOO” in our neighborhood, too! It’s fun for the kids…and for us, too, if I’m honest! Love your BOO bags with the ribbon! I’ve just recently heard of the Boo game and think it’s adorable! Great fun! I have never heard of this before but I love the idea! We have a lot of elderly neighbors but maybe this might just be the thing to bring a touch of fun and surprise into their day! Your daughter is a doll! Such a great photo. we’ve been booed too! such a fun treat! We moved to a new neighborhood this year outside of Seattl and got boo’d for the first time. The kids and I have had a great time making up our boo buckets and deciding who to boo. We picked one family with small kids and one with grown children and food the bucket with spiced nuts, candy and some treats for their dog, their furbaby. I have never been Boo’d but I which I had! This looks like so much fun and I think it would be a great idea to do it around Christmas with a different poem and Secret Santa bags… I’m used to the old Secret Santa gift exchange, but this would take it to a whole new level if you’re secretly dropping the bags off at your neighbors’ houses. Little treat bags decorated for Christmas would be so cute! Thanks for the idea! I didn’t even know anything about this! Wow. Guess my neighbors didn’t know each other that well when I was growing up and now that my husband and I rent, it’s not easy to do ourselves. Maybe I’ll do it to my in-laws :D That could be fun! I’ve never been boo’d, but I’ve been flamingoed! Around here it’s called “Ghosted” as they put cute little white ghosts on your window or front door. My girls are older now, so we don’t usually get “ghosted” anymore. But, my older daughter is thinking of doing it in her apartment complex as several of her college friends live there. I think it would be fun in a college dorm as well! Sara, now I want to be flamingoed!!! Our neighborhood in Massachusetts was big on “boo-ing” eachother! But our neighborhood here in Utah? Not so much! So we started the “boo” tradition here this year! Nothing is more fun than anonymous goodies at your door! I’ve never heard of this before but I love it! My kids would so enjoy doing this. Thank you for sharing. our neighborhood is all about this boo tradition. it’s fun. although nothing has come around as cute as these bags. maybe next year. How cute! I have never heard of this concept before but it sounds like super fun! Excuse me while I go check my front door to see if I have been boo-ified. Maybe I’ll BOO the little old lady across the street! Love the BOO bags! We do that every year!! Fun! Fun! Fun! I have been BOOed and I attempted to BOO some neighbors since I was BOOed (that’s a lot of Boos). Anyways, this was when I was in high school. My mom and I were driving around booing a few neighbors. I would run up to the door, place a bag of treats on the doorstep, ring the doorbell, then run to the car. At one of the houses, I did all of the above…except run to the car. I rang the doorbell, turned around, ran down the one step that led to their door…oh no, wait. There were two steps. I realized this too little too late. I laid sprawled out flat on my face on their sidewalk. As I was lying there I was thinking, “I have GOT to get up or they’re going to come to the door and see me lying like this and they will be scared and confused. Embarrassing!” So I pulled myself together, stood up and kept running to the car. I don’t know if they saw me. I never looked back. I skinned my knees pretty badly and tore two holes in my favorite pair of jeans. My mom patched me up as a good mom does, even for her almost grown daughter. I started swim practice the next day. Scabs in water…not fun and not pretty. Oh, and embarrassing to be 17 years old with two gigantic skinned knees because you were BOOing neighbors with your mom. I still have a scar on my knee from this BOOing experience. And I’ll always have this ridiculous memory that I think of every Halloween and whenever I’m back home and drive past the house. So yes. Yes, I have been BOOed. And I got more than I bargained for! our neighborhood does it every year! Usually kid goodies like pencils and a toy or a Halloween storybook…my children love it. That picture of your daughter is too cute! I love it! We got BOO’ed last year and we played along and BOO’ed a couple neighbors. I didn’t get it together soon enough this year and we haven’t gotten BOO’ed yet either. So I guess no one is doing it. Your bags are really cute. It’s so much fun! I love the “boo” game. You also need to make a sign to put on your door that says that you have been boo’ed so that you are not boo’ed several times. Thanks!! I LOVE this idea! I don’t think it exists here in Australia..and I am so keen to introduce it to my friends!! Thank you for sharing. Happy Halloween to you all the way from Sydney! We’ve been booed twice, in previous years. Thanks for reminding me; I’d better get crack a lacking! I too love your cute little boo bags. That is so fun! I was just thinking about Secret Santa this year and feeling kinda sad about it since I don’t have any co-workers to play with this year! What a great alternative!! And your daughter is just darling! Love this idea! Will have to do that this week to a few of my neighbors. My 94 year-old neighbor will get a kick out of it! :-) P.S. I started my blog yesterday! Woo-Hoo I am thrilled! I moved to Folsom in 99. Been Boo’d every year. So fun! I love this time of year and i love the harvest image! So exciting! Our neighborhood also does this, however once we’ve been BOOed, we hang up the picture of the ghost that was left with our treat bag on our front door so we can’t be BOOed again. It is very fun! Oh, and the person who “Booed” us put it in a cloth trick-or-treat bag, which I thought was clever. Now one of our kids can use it for candy on Halloween! I was tired of my kids having all the fun, so three years ago I started putting gift baskets together for my friends complete with wine and goodies. I made up a poem and made a sign to say, I’ve been BOOzed! Lol! I love to get Halloween wine glasses and buckets on clearance to prep for next Halloween! Martha, I would love if you would share your “BOOzed Poem”! I know Christmas Tree Shop has adorable wine glass charms and Halloween decorated wine classes. Anyone know what to do when your kids don’t get booed? They are heartbroken! Should I boo them myself? We tried to keep it going by just booing 2 more neighbors but still haven’t been booed! 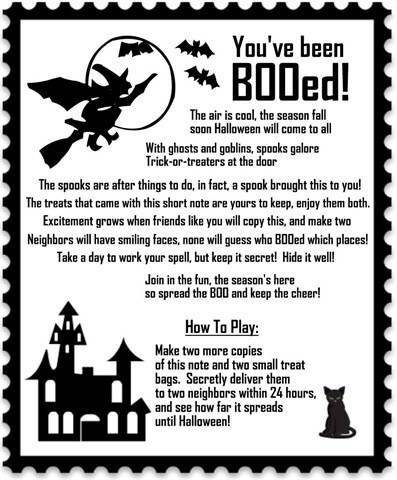 I just printed the BOOing game and cant wait for Halloween to Boo some of my new neighbors with kids. Love this idea! I am going to do this at my granddaughter’s school. I am a teacher and this went around our building last year. It was so much fun! We hung our BOO signs on our classroom door so we knew who we couldn’t BOO anymore. Just moved into a new development and am debating BOOing the neighbor across the street.